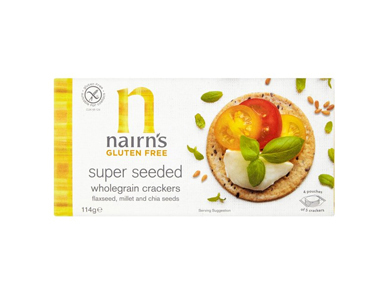 Buy Nairn's Gluten Free Super Seeded Wholegrain Crackers 114g in the UK from our online shop or directly from our independent Scottish store. If you want to automatically receive an email when 'Gluten Free Seeded Crackers' is back in stock, just leave your email address below. These Gluten Free Super Seeded Wholegrain Crackers are full of delicious flax, millet and chia seeds, which makes them even more crunchy and so tasty, you can enjoy them with or without a topping. Our Gluten Free Super Seeded Wholegrain Crackers are full of delicious flax, millet and chia seeds, which makes them even more crunchy and so tasty, you can enjoy them with or without a topping. These seeds are a great source of protein, as well as being high in fibre and rich in Omega 3, so are a great natural way to fuel your day. Use seasonal vegetables like celery sticks, carrots and sweet or bell peppers. This recipe contains Gluten free oatcakes. Where can you buy real Gluten Free Seeded Crackers safely online? If you are wondering where you can buy Nairn's Gluten Free Super Seeded Wholegrain Crackers 114g safely online in the UK, then shop with us. Gluten Free Seeded Crackers - Nairn's Gluten Free Super Seeded Wholegrain Crackers 114g in Oatcakes & Oat Biscuits and Biscuits & Breads.